World Youth Conference facilitate a process that strengthens effective youth participation in the planning, implementation and evaluation of various global issues of the world which refers to the process of defining the future global development framework that will succeed the Sustainable Development Goals (SDG’s) of the United Nation. The Conference will also create an inclusive platform for youth that enables them to review the progress of the SDG’s, share ideas, experiences and innovative approaches for effectively contributing to the SDG framework and its implementation. It was held in 2010 in Belgium, 2012 in Mexico, 2014 in Sri Lanka, 2016 in India, 2017 in Belize & upcoming 2019 in Mauritius. It brings together young delegates from all over the world to exchange views, share experiences on different issues, detect common preoccupations and to develop realistic action plans to rebuild communities that meet the needs and aspirations of young people. The event allows people to voice their ideas and concerns and make suggestions directly. As a whole the World Youth Conference 2019 will be a meeting point for the representatives of youth-led networks, governments and civil society organizations designed to identify priorities of action for youth to be dealt with on the international development agenda beyond the SDGs. This forum will strengthen cooperation links between country and stakeholders involved with youth policies. Selected Speakers from amongst the delegates will get free round trip flight tickets. 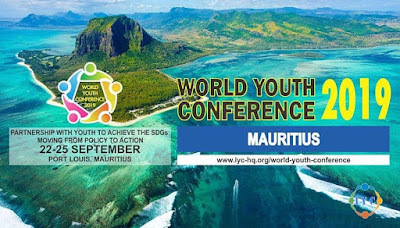 To create an inclusive youth participation platform that enables young people to review the progress on the achievement of the Sustainable Development Goals. To share ideas, experiences and innovative approaches for effectively implementation of the Sustainable Development Agenda. To facilitate a process that increases awareness on and implementation of the World Programme for Action on Youth (WPAY). To facilitate effective partnerships with youth, youth-led organizations and youth movements to further strengthen inclusive youth participation in the decision-making processes and implementation of the sustainable development agenda. To contribute to the establishment of a permanent youth engagement mechanism that ensures consistent follow- up with young people and further boosts their participation and partnership in the implementation of the SDGs at national, regional and global levels. Recommendation made during the conference will be send for policy formulation to both Local and National Governments and other International Organization like, UNESCO, UNDP, UNICEF and other bodies on youth resilience, rebuilding communities and disaster response.